Lock in a great price for Radisson BLU Hotel Amsterdam Airport – rated 8.3 by recent guests! Far enough away from the airport but close enough for 10 mins by shuttle. Radisson Blu is always a dependable hotel that's clean and quiet, with excellent food & rooms. We used the family room and it was great. Very roomy. Spacious and clean room. Comfortable bed. Bathtub with good water pressure. Location is convenient ( the second stop) when using aiport shuttle bus. We stayed there only one night before returning flight. Breakfast was excellent, but 20 euros is way overpriced. Radisson BLU Hotel Amsterdam Airport This rating is a reflection of how the property compares to the industry standard when it comes to price, facilities and services available. It's based on a self-evaluation by the property. Use this rating to help choose your stay! Radisson Blu Hotel Amsterdam Airport is located in the green business park Schiphol-Rijk, only a 15 minute drive from Schiphol Airport. The property offers a 24-hour free shuttle bus service to and from Schiphol Airport. The hotel rooms are spacious and offer coffee and tea facilities as well as free high speed WiFi, which is available in the entire hotel. The Talavera Restaurant serves breakfast every morning while OTIUM Restaurant serves light and healthy meals. OTIUM Lounge offers cold beverages and light snacks in a lounge atmosphere. 24-hour room service is available. Private parking is available for a surcharge. Radisson Blu is located 45 minutes away by public transport from Amsterdam's city center, RAI Convention Center and the Amsterdam WTC. The nearest Airport is Schiphol International Airport, and is a 20 minutes drive from Radisson Blu. This property is also rated for the best value in Schiphol! Guests are getting more for their money when compared to other properties in this city. When would you like to stay at Radisson BLU Hotel Amsterdam Airport? - Free shuttle service to and from Schiphol Airport 24 hours a day. Private parking is available on site (reservation is not needed) and costs EUR 3 per hour. Spacious room features a Nespresso machine and a welcome drink voucher. It also includes a daily newspaper, complimentary in-house movies and a modern bathroom with a bathrobe, slippers and body products. Please contact the property when booking the junior suite for 4 guests, suite sizes differ between 36 to 51 square yards. Most suites have a separate living area, while all suites include a Nespresso coffee machine. All guests are welcomed with a drink voucher. This offer includes an overnight stay in a Standard Room, including 14 days of free parking in a secure parking facility. 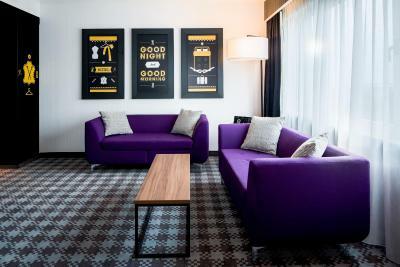 The Standard Room includes complimentary use of the shuttle service from and to Schiphol Airport 24 hours a day, free use of WiFi and 24-hour use of the Health and Fitness center. There are 2 rooms with a connecting door. High speed WIFI is included. This twin/double room features a mini-bar, air conditioning and high speed WiFi. This family room features a tea/coffee maker, electric kettle and soundproofing. This suite features a view, electric kettle and mini-bar. All 281 fashionable rooms and suites provide thoughtful amenities like free high-speed, wireless Internet, and 24/7 complimentary shuttle service to and from the airport is included with your stay. House Rules Radisson BLU Hotel Amsterdam Airport takes special requests – add in the next step! Radisson BLU Hotel Amsterdam Airport accepts these cards and reserves the right to temporarily hold an amount prior to arrival. Please note that a safety deposit of EUR 50 per night per room is required upon arrival. This will be refunded after check-out and subject to an inspection of the room. Secured parking is available, the first two hours are free of charge. The following hours cost €3,- per hour with a maximum of €25,- per day. A Grab & Run service, offering a free, small selection breakfast is available for early risers between 05:00 and 06:00. The free 24/7 shuttle service runs every 40 minute, with a schedule. Between 23:30 - 06:00 hours it is available upon request. A bit more dated than i thought. The room was spacious, toilet was really nice and the shuttle to the airport was really convenient and on time! Best part is that you will be the first one to get on the shuttle (to the airport) so there wont be an instance where you will not board the bus. There is a nice small table where you can do your work, many english channels on the tv. bed was big and comfortable and staff was really friendly. The shuttle bus frequency could be improved to cater for large crowds especially during the public holidays. We were lucky to board the bus each time but not the other hotel guests. Room is bigger than our expectation. The toilet is equipped with bath tub which is great for soothing. The bed is comfortable that provides you a good sleep throughout the night. Paula, our hostess for the restaurant, was wonderful, and the breakfast was delicious. I had to go down and get the plates myself. Everything was chargeable. service was excellent. Room was very clean. Floor we stayed on had not been renovated; part of my family stayed on another floor and that floor was much nicer! City Tax and surcharges were confirmed as 5 Euro during check in; charged 11 Euro during check out. Property itself was so beautiful. I was in 724. Could see the entire landscape though the large window.